Growing our own fruit, veg and herbs is satisfying on so many levels. All that mucking around with dirt. Planting and transplanting seedlings or digging in bulbs. The sheer beauty of the first green shoots poking through the brown. The fun of figuring out what herbs and flowers to plant around veg to deter bugs and the weeding and watering. Best of all is eating a sweet tomato or something yummy, fresh from its earthy bed. Our raised beds are a triumph. They were lovingly constructed from recycled railway sleepers, with lots of measuring and staking and re-measuring and checking levels. Look at them bursting with life! Composting is an important part of our work in the garden. Our chambers contain compost made from recycling fruit & veg peelings, grass cuttings etc. We also have a homemade worm composter (we re-purposed a disused dustbin) which creates rich, moist fertilizer. We make organic plant food from the herb Comfrey. 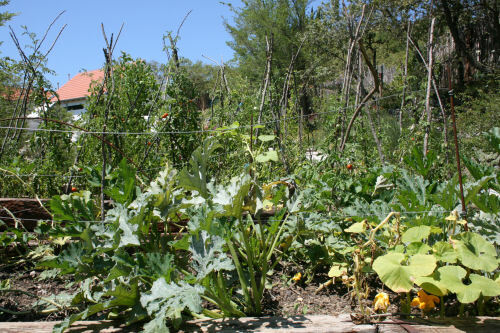 These are the only things we put onto our soil – no pesticides or harmful nasties in our organic gardens! Hi, I think we have looked into this before or something similar but it either cost too much money to apply or there was something about our operation that excluded us. I had a look at the link but my German is not great. I did find a page in English but couldn’t find any links to a “how to apply page”. If you have the time to explain it or give us some advice that would be much appreciated. I’ll e-mail you directly. Many thanks. Why you not apply for the EU Ecolabel for campsites? I am the auditor for Montenegro and can help you with this.